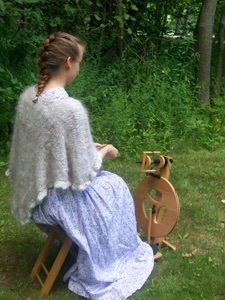 A place of hand spun and hand knit treasures made by a homeschool graduate & historical re-enactor for the glory of God and the edification of others. Contact me for a lesson or demonstration in the local Midland, Michigan area. See me on Etsy! You can shop there for now, but first enjoy browsing through the tabs above for pictures, details, and descriptions!